The Design Section integrates North Dakota State University (NDSU) engineering students with real world transportation designs and engineering issues. 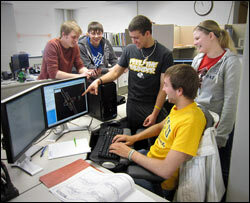 Teams of engineering students work under the direction of transportation designers to prepare plans, estimates and studies for transportation projects. One goal of the program is to familiarize students with the North Dakota Department of Transportation (NDDOT) and typical transportation issues. Another goal is to encourage students to enter the transportation field upon graduation and stay and work in North Dakota with either public or private engineering institutions. Student transportation engineers who work for DOT Support Center (DOTSC) train on software used by the many transportation organizations and receive orientation on the programs and procedures for developing transportation projects. In addition to working in transportation design, student engineers also get the chance to assist in transportation related research. In an effort to create a balanced look at all the opportunities that the NDDOT has to offer students are exposed to as many phases of the transportation engineering process as possible. Students that work during the summer have the opportunity to shadow a field engineer for a week and take several tours of interesting construction projects going on. Microstation/Geopak is the civil engineering software utilized by the NDDOT. All of the civil engineering interns become very proficient drafting and designing with this software. They are exposed to challenging tasks associated with transportation infrastructure and the rewarding experience of finding solutions by applying skills they have developed in their academic careers. Learning MicroStation and Geopak design software – This is the software that is used by 38 state DOTs. Working on environmental documents – Writing a report that explores all options for a project and helps upper management make decisions on how projects should proceed. Developing plan sheets – Working to putting together a complete set of plans that can then be taken into the field and constructed. Preventative maintenance projects – Working to extend pavement life and increase ride quality. Structural overlays – Working to give the roadway more load carrying capacity. Concrete pavement repair projects – Rehabilitating concrete pavements by replacing bad sections of concrete and cutting in load transfer devices. Reconstruction – Totally removing the existing roadway and then completely building a new roadway in its place.